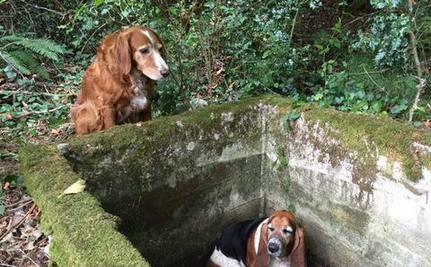 Old friends make the best friends, and for two Washington state dogs named Tillie and Phoebe, that is especially true. Could this pair teach us all something about the true meaning of loyalty? The dogs made a quick escape from their home a week ago when a door was left ajar during a party. 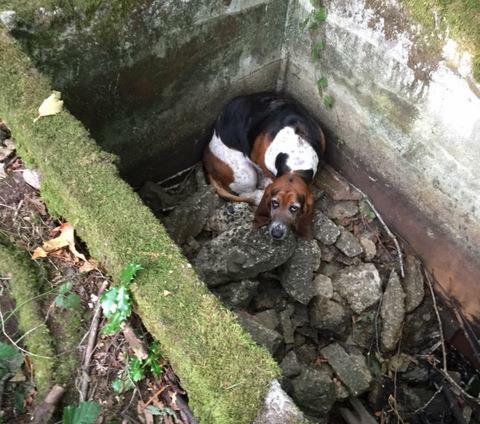 What began as a mischievous adventure soon turned to misery when Phoebe, a 4-year-old Basset Hound, made her way into a cistern and simply couldn’t climb back out. Eleven-year-old Irish setter mix Tillie, who is considerably taller than her pal, tried several times to go for help but to no avail. Tillie would sleep perched above Phoebe and wait with her throughout each day, leaving only briefly to try to find human aid. Phoebe was indeed in great danger but she was never alone in her ordeal. Her best friend simply refused to abandon her. Residents witnessed Tillie running through a back yard several times over the course of the week, but they didn’t realize what was happening until a volunteer group called Pet Protectors put out a distress call on Facebook. Pet Protectors soon received a lucky tip from someone who had seen Tillie several times. The dogs’ guardian B.J. Duft had been beside himself with worry during the ordeal and was relieved to learn that the dogs were still together. The dogs have an interesting history together. Tillie had been living with Duft since she was a puppy, but the two welcomed Phoebe into their home some time ago after the dogs became fast-friends at doggie daycare. “They’re best pals — inseparable,” Duft said to ABC News. Tillie and Phoebe are both back home and happy. Neither of the dogs suffered any major health issues as a result of their ordeal and now that the two are back home, they’re facing significant penalties for their actions. “Their ‘punishment’ was extra hamburger and a roast when they got home because I was so thrilled to see them,” Duft said as the two dogs rolled around on the living room floor. Both dogs are now sporting new GPS enabled collars to ensure that they’ll never be lost again. We Won!! Karma is saved!! We Won!! Karma is saved!! Thank you so much to everyone that helped it took a huge amount of people to do this and I appreciate everyone that helped we couldn't have done it without you!! Look for a GoFundMe in a future update to help with costs of court filings and special reports that were needed. Ghost Kitty Discussions: Either I have as vivid an imagination as these posters or the spirit of a recently deceased kitty visits his human friend for a while. I'm on the others side but I wanted to visit you, my old friend and companion. The other side is real, not wishful thinking by "foolish" humans. I live in a house at the dead end of a 3 way crossroad. There is high entity traffic & my parrot can see entities. I can see them out of the corners of my eyes in the daylight. In the dark it is very easy to see an entity. There is only one entity that my parrot likes. When she pets her my bird just groans happily. There are ghost kitties in our apartment! I know at times our three cats see them. I on the other hand can only feel them brush by in an instant. My roommate can see them. Our recently departed Kitters came by twice that he saw. After my first cat was killed by a dog that entered our yard, he kept going to bed with me until I adopted my current cat. It lasted for about 4 months. I could feel him walking on the bed as soon as I went to bed, just like before. 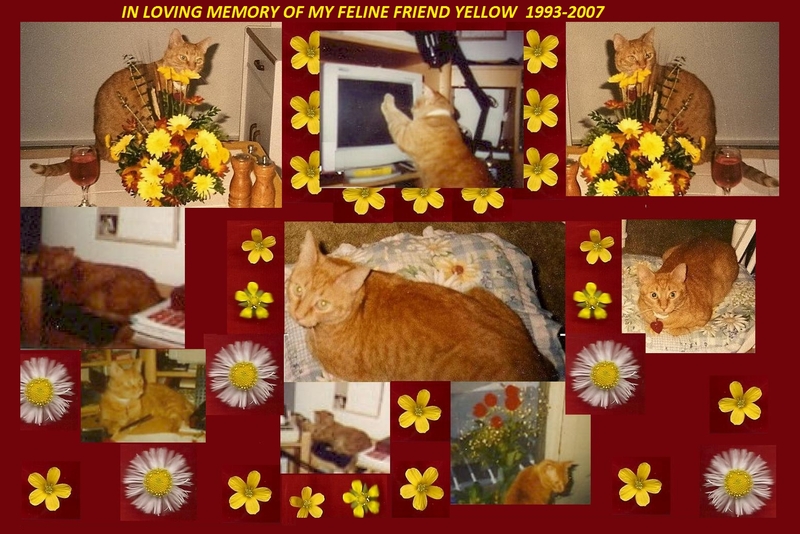 When my third cat died of old age, she came by the evening of the day she passed away and jumped on the bed where my second cat and her slept. He was with me in the living room and I know he heard her jump also, because he looked towards that door same time as me. 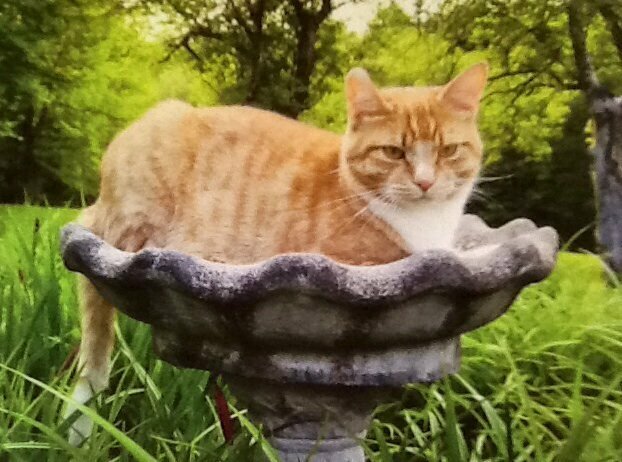 I'd give just about anything to have a visit like that from my beloved Ragnar, who passed away in 2013. I can feel presences (and occasionally feel his), but would SO love to feel him walking on my bed again. 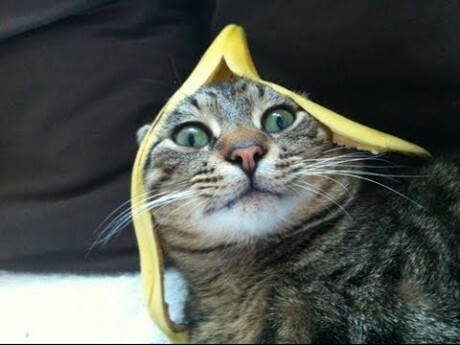 I believe your comment about the ghost kitten. I am in a new apartment, when I lay in bed on occasion I will feel small paw prints of what feels like a cat or kitten walking across my legs or settling at the foot of my bed. What Cats and Dogs Can See that Humans Can’t: You Won’t Believe it! Cats understand the principle of cause and effect as well as some elements of physics. Combining these abilities with their keen sense of hearing, they can predict where possible prey hides. These are the findings of researchers from Kyoto University in Japan, led by Saho Takagi and published in Springer's journal Animal Cognition. Previous work conducted by the Japanese team established that cats predict the presence of invisible objects based on what they hear. In the present study, the researchers wanted to find out if cats use a causal rule to infer if a container holds an object, based on whether it is shaken along with a sound or not. The team also wanted to establish if cats expect an object to fall out or not, once the container is turned over. Thirty domestic cats were videotaped while an experimenter shook a container. In some cases this action went along with a rattling sound. In others it did not, to simulate that the vessel was empty. After the shaking phase, the container was turned over, either with an object dropping down or not. Two experimental conditions were congruent with physical laws, where shaking was accompanied by a (no) sound and an (no) object to fall out of the container. The other two conditions were incongruent to the laws of physics. Either a rattling sound was followed by no object dropping out of the container or no sound while shaking led to a falling object. The cats looked longer at the containers which were shaken together with a noise. This suggests that cats used a physical law to infer the existence (or absence) of objects based on whether they heard a rattle (or not). This helped them predict whether an object would appear (or not) once the container was overturned. The animals also stared longer at containers in incongruent conditions, meaning an object dropped despite its having been shaken noiselessly or the other way around. It is as if the cats realized that such conditions did not fit into their grasp of causal logic. "Cats use a causal-logical understanding of noise or sounds to predict the appearance of invisible objects," says Takagi. Researchers suggest that species' surroundings influence their ability to find out information based on what they hear. The ecology of cats' natural hunting style may therefore also favor the ability for inference on the basis of sounds. Takagi explains that hunting cats often need to infer the location or the distance of their prey from sounds alone because they stake out places of poor visibility. Further research is needed to find out exactly what cats see in their mind's eye when they pick up noises, and if they can extract information such as quantity and size from what they hear. I am pondering the derivative of ballistic trajectories and any accompanying acoustic differences in order to compute my chances of a quick lunch. Yes, I really am up here for my health. LOVED the NiBIRU "Combat Training"
I had a dog just like that one and the cat is an identical twin to one I shared many years with. Also, excellent current skycam photo and condition research tools. I cannot make heads or tails out of those orbs except that they should not be there. Having a younger sibling comes with a ton of perks. You always have someone to talk to, someone to boss around, and someone who will always have your back when things get scary. But being adored by a little one has one small drawback. You’re the center of their world, which can make getting alone time impossible!. Rescued Kitten is Madly in Love With His New Family’s Dog. 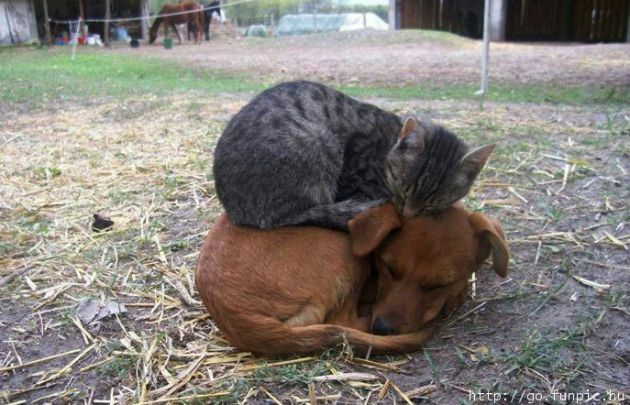 The Dog Doesn’t Seem to Mind At All! Watch Shelter Dogs and Cats Go From Sad to Ecstatic After Receiving Surprise Christmas Toys! Christmas can be a joyous time for many. With festive lights, good cheer, and the company of your friends and family, the holidays are filled with love and happiness. But for the six to eight million animals that enter U.S. shelters every year, Christmas can be depressing. Many wonderful volunteers will take the dogs out for walks and will maybe have a few minutes of play time, but at the end of the day, the dogs and cats are alone once again. But one animal shelter is working towards changing that. Every year, the Animal Rescue League of Iowa asks their volunteers and supporters to put toys, food, and supplies underneath the “Tree of Life” so that they can collect donations for homeless animals. Not only do animal lovers stock the tree full of goodies, but the dogs and cats get to pick out their very own toy! As seen in the video above, the pups rush over to the “Tree of Life” and eagerly pick out a toy they can call their own. The smiles and tail wags as they learn Santa Paws didn’t forget about them are absolutely contagious. Santa Paws didn’t forget about the many homeless cats either – the felines all get some toys to keep them entertained and happy. If you’re considering welcoming a four-legged companion into your home, please always adopt and never shop. And if you’d like to get involved with your local animal shelter, check out our guide to volunteering. Squirrel Reunites With His Best Cat Buddy and … OMG! If anybody out there had any lingering doubts that animals can remember their friends, this video will quickly eradicate them. This family had a pet squirrel. While having a wild animal as a pet is never a good idea, they eventually did the right thing and released him back into the wild where he belongs. Clearly doing well, the little guy would pop back in from time to time in order to visit his best buddy … the family cat! The pair clearly enjoy one another’s company, rolling around playfully and wrestling like two toddlers on a playground. Watching these two, we can’t help but be reminded of the deep social bonds that animals form, no matter what species they come from. Once again, we all could take a lesson from these animals that it doesn’t matter where you come from or what you look like. A friend is a friend. Do Any Animals Show a Preference for Right or Left “Handedness”? Just as people are either right or left-handed, cats often have a dominant paw preference, which they may demonstrate when they’re reminding you that it’s time to eat or boxing that new feathered cat toy. Researchers at Queen's University Belfast's School of Psychology wanted to know more about this feline behavior, and collected data from 44 cats (24 males and 20 females) of varying breeds, gathered over a period of three months by the animals' owners. They found that the male cats strongly favored their front left paw, while the female cats favored their front right paw. Researchers were interested in which paw the cats led with when walking down stairs or accessing litter boxes. Each cat was also studied while fishing out treats from a food maze. About 73 percent of the cats showed a lateral bias when reaching for food; 70 percent displayed a preference when going down stairs; and 66 percent used one paw more prominently when accessing a litter box. Left-limbed animals, which rely more heavily on the right hemisphere of the brain, tend to display stronger fear responses and aggression than right-limbed animals, which are left brain dominant. Kitty  wants in NOW! A lesson in feline perseverance. Funny moments with cats and drones.